Underlay is used under floor covering materials (parquet, laminate) on hard and dry base surfaces. Underlay levels the minor unevennesses of the subfloor, mutes the sounds of footsteps and makes the floor warmer. It is advisable to keep the underlay in the same room they are to be installed in for 24 hours before installation in order to balance the moisture inside the boards with humidity of the surrounding air. The boards are placed sideways and bars are put under and between them, so that the boards are exposed to air. Underlay is placed next to each other on base surface, leaving 5–10 mm expansion gaps between the boards and the walls. In order to get an adequate expansion gap, you can place pieces of underlay between the walls and the boards and remove them later when all the underlay is installed. 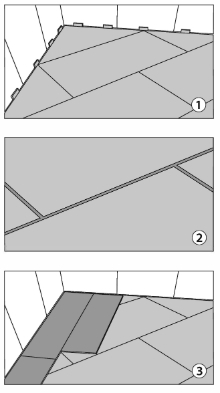 Leave 1–2 mm gaps between the underlay (see Figure 2). You can fix the boards with couple of glue dots (Figure 3) or staples/nails in order to secure them. Underlay is installed in a way that the angle between the joints of flooring and the joints of boards would be 45˚, this helps to avoid the joints of the boards and flooring to overlap (Figure 2 and 3). Floorings are installed directly on underlay (Figure 3).